What you’ll see – Recreated Tucson of 1900. The main adobe building you enter contains exhibits dealing with southern Arizona’s rich history. 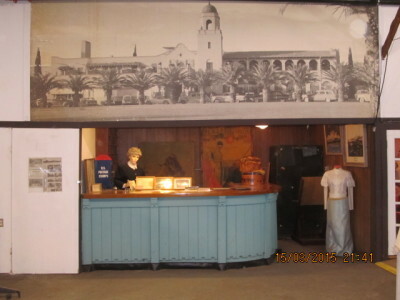 The adobe structure was built in the 1930s to house the sheriff’s livery, then later became the Pima County Fair exposition building. 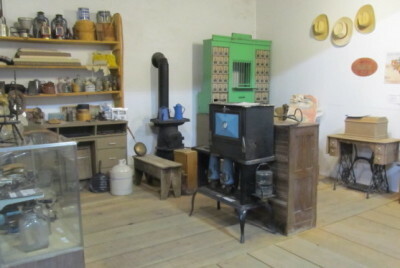 As you enter the museum, the first exhibit on your left is the Blacksmith shop, complete with hearths, bellows, and related ‘smithy’ tools. The walls are lined with tools the ‘smithy’ would make, or repair. Next you’ll come to a fully equipped saddle shop, also featuring oxen yokes. A laundry is next, attributing the Chinese influence on Tucson. A ‘line shack’ follows, with its depiction of home away from home, where ranch employees could find shelter when they were required to work great distances from the main ranch. This is followed by a jail cell, complete with the iron door and lock-box first used on Tucson’s city jail. Our Mercantile display is next. It’s just been added and features items you could have purchased for your home. Spend some time in the display and treasure the artifacts. The Railroad display is also a recent addition, and features a ‘G’ gauge model locomotive and cars provided by the Tucson Garden Railway Society in a layout that is true to that of 1890 Tucson – businesses, church, saloon, cattle pens, tent city, etc., complete with the sounds of cattle, music and church bells. Members of TGRS built and maintain this treasure. 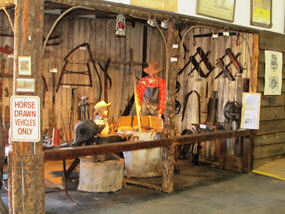 On the walls surrounding the display are tools and many old-time railroad related items are also exhibited. Along the walls leading back toward the center of the building you’ll find a wide variety of artwork and exhibits dealing with ranching and western history. Before turning to go into the harness room, a treadle powered Singer leather sewing machine, which we still use, a boot stretcher, and leather punch stand on display. Our harness room has racks full of harness. The workroom here is active and we constantly maintain our inventory. The large sewing machine is in ready-to-use condition. Next you’ll see a barb-wire display with many unusual types exhibited. Crossing the building, the next display is The Storks Nest birthing center, located to the right of the main entrance. 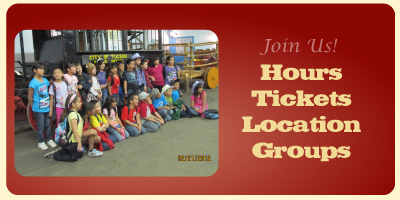 Active in Tucson for over 25 years, thousands were born here. Read the fascinating history of this exhibit. The Lily Langtry Saloon is next, followed by Cele Peterson’s dress shop, both featuring true-to-their time displays. Tucson’s first 4-star resort/hotel, the El Conquistador exhibit is next, with many of the artifacts from the site displayed. Across the building is a display related to the airport, which originally occupied the land that is now the rodeo grounds. This is followed by an exhibit of the original Jacobs Assay Office business dating to 1880, and a barber shop. Finally you enter the original airport hangar, abutted to the adobe building, with its fascinating history. Additional displays are found throughout the Hangar and Buggy Barn.